Below you fill find all funeral homes and cemeteries in or near Alamogordo. Suburbs of Alamogordo: White Sands National Monumen. 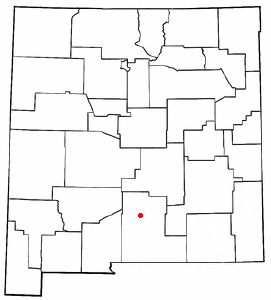 Alamogordo is also known as: Otero County / Alamogordo city. Their current mayor is Mayor Susie Galea. Zip codes in the city: 88310, 88311. Otero County funeral flowers can be purchased from one of the local funeral shops we partner with. Alamogordo has been featured in films like: Transformers: Revenge of the Fallen (2009), and This Must Be the Place (2011). Some of the notable people born here have been: Cindy Chavez (politician and teacher), Billy McMillon (baseball player and manager), Donna Barton Brothers (jockey), Phillip Kimbrough (film score composer and actor), Sergio Mojica (actor), and Frank Orrall (actor). Alamogordo /ˌæləməˈɡɔrdoʊ/ is the county seat and economic center of Otero County in south-central New Mexico, United States. A city in the Tularosa Basin of the Chihuahuan desert, it is bordered on the east by the Sacramento Mountains and to the west by White Sands National Monument. It is the city nearest to Holloman Air Force Base. The population was 30,403 as of the 2010 census. Alamogordo is known for its connection with the Trinity test, the first explosion of an atomic bomb, and also for the Atari video game burial of 1983.Humans have lived in the Alamogordo area for at least 11,000 years. The present settlement, established in 1898 to support the construction of the El Paso and Northeastern Railroad, is an early example of a planned community. The city was incorporated in 1912. Tourism became an important economic factor with the creation of White Sands National Monument in 1934. During the 1950-60s, Alamogordo was an unofficial center for research on pilot safety and the developing United States' space program.Alamogordo is a charter city with a council-manager form of government. City government provides a large number of recreational and leisure facilities for its citizens, including a large park in the center of the city, many smaller parks scattered through the city, a golf course, Alameda Park Zoo, a network of walking paths, Alamogordo Public Library, and a senior citizens' center. Gerald Champion Regional Medical Center is a nonprofit shared military/civilian facility that is also the hospital for Holloman. It was disclosed on December 9th, 2018 that Kalesa Denise Burnett (Warner) passed on in Alamogordo, New Mexico. Ms. Burnett was 56 years old. Send flowers to express your sorrow and honor Kalesa Denise's life. It was noted by The Daily Tribune on November 7th, 2018 that Angelina M Wilson (Jimenez) passed on in Auburn Hills, Michigan. Ms. Wilson was 66 years old and was born in Alamogordo, NM. Send flowers to express your sympathy and honor Angelina M's life. It was revealed on September 7th, 2018 that Vivian Clare Johnson (Bays) died in Arlington, Texas. Ms. Johnson was 86 years old and was born in Alamogordo, NM. Send flowers to express your sympathy and honor Vivian Clare's life. It was reported on May 17th, 2018 that Michael G Fowler perished in Alamogordo, New Mexico. Fowler was 67 years old and was born in Peoria, IL. Send flowers to express your sympathy and honor Michael G's life. It was reported on May 9th, 2018 that Frank Odenwald perished in Alamogordo, New Mexico. Odenwald was 94 years old and was born in Milwaukee, WI. Send flowers to share your condolences and honor Frank's life. It was revealed by The Advocate on March 7th, 2018 that Elizabeth Ann Achee passed away in Columbus, Ohio. Achee was 57 years old and was born in Alamogordo, NM. Send flowers to share your condolences and honor Elizabeth Ann's life. It was disclosed by San Diego Union-Tribune on January 7th, 2018 that Stuart Brian "Stu" Motter died in San Diego, California. Motter was 56 years old and was born in Alamogordo, NM. Send flowers to express your sympathy and honor Stuart Brian "Stu"'s life. It was reported by The Herald on January 7th, 2018 that Sigmund Dean Thomson died in Seattle, Washington. Thomson was 68 years old and was born in Alamogordo, NM. Send flowers to express your sorrow and honor Sigmund Dean's life. It was written on January 4th, 2018 that Wilford F Gordon passed on in Alamogordo, New Mexico. Gordon was 96 years old and was born in Oakwood, TX. Send flowers to express your sorrow and honor Wilford F's life. It was noted by The Herald on November 7th, 2017 that Claudeen Marie Thompson passed away in Washington. Thompson was 68 years old and was born in Alamogordo, NM. Send flowers to express your sorrow and honor Claudeen Marie's life. These include the Federal Building at 1101 New York Avenue, a Pueblo Revival Style architecture style building originally constructed as the main US Post Office in 1938. Eddy influenced the design of the community, which included large wide thoroughfares and tree-lined irrigation canals. Eddy, extended the railway to the town. The Post Office moved out in 1961, and the building was used by a succession of Federal agencies. Several buildings in Alamogordo were constructed by the Works Progress Administration. The official website for the city of Alamogordo is http://ci.alamogordo.nm.us/. including president of the New Mexico Funeral Service Association from 1999-2000. "I love Alamogordo," House said. "It is a great place to raise a family. There is a slower pace, but so fulfilling. I have enjoyed community service in Alamogordo. Listing all funeral homes in Alamogordo, New Mexico so you can easily send flowers to any location (same day delivery) or find any funeral service. Find funeral directors & Funeral Directors in Alamogordo, NM. Read business reviews, find driving directions, and more. funeral directors on YELLOWPAGES.COM. We work with local florists and flower shops to offer same day delivery. You will find budget sympathy flowers in Alamogordo here. Our funeral flowers are cheap in price but not in value.